BC Parks is home to over 1,000 provincial parks and protected areas that range in diversity, from rugged coastlines and snow-caped mountains to dense rainforests and vast grasslands. Over 21 million visitors enjoy BC Parks each year, but there are many unique experiences, features and ecosystems that thrive in BC Parks that remain relatively unknown. Here are five things we bet you didn’t know about BC Parks. Have you ever wanted to experience time travel? 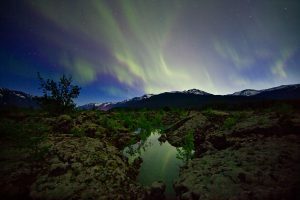 You can at Purcell Wilderness Conservancy Provincial Park. The park is divided across two time zones, Pacific Standard Time (PST) and Mountain Standard Time (MST), so you can hike by day in one time zone and camp by night in another. If you’re an experienced wilderness hiker, we recommend the western trailhead of the Earl Grey Pass Trail. The trail starts in the PST zone near the small community of Argenta at the north end of Kootenay Lake. It crosses the Purcell Mountains through the Purcell Wilderness Conservancy with an eastside trailhead near Invermere in the Columbia Valley, which is in the MST zone. View the trail map here. Using the TrailRider wheelchair, individuals with disabilities are able to experience Strathcona Provincial Park near Campbell River in ways they never thought possible: over rocks and roots, up and down stairs and past lakes while visiting the most scenic areas of Paradise Meadows on Forbidden Plateau. A TrailRider is a unique single-tire backcountry wheelchair assisted by two to six operators or sherpas. They’ve been tested on various terrains from Mount Everest base camp to the top of Mount Kilamanjaro. 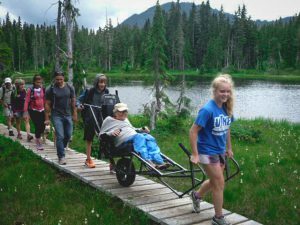 The Strathcona Park TrailRider Wheelchair Program is offered by Strathcona Wilderness Institute in partnership with BC Parks. At Strathcona, TrailRider visitors are now able to experience the first dock created in the backcountry, and have access to the first toilet capable of accommodating a TrailRider wheelchair. Rainbow Range is an ancient volcanic mountain range located in Tweedsmuir Provincial Park (South). It’s also known as the “Tsitsutl” in the Carrier dialect, meaning painted mountains. The mountain range is decorated with a spectrum of vibrant red, orange, yellow and lavender coloured lava rock. Rainbow Range is a great day hike, offering the shortest route to the alpine and excellent views of the colourful mountain peaks. The mountains and wide glacial valleys provide an ideal habitat for wildlife such as caribou, wolves, mountain goats and grizzly bears. The trail winds its way through stands of whitebark pine and alpine fir to a small alpine lake. After the lake, experienced hikers can explore almost unlimited terrain. Anhluut’ukwsim Laxmihl Angwinga’asanskwhl Nisga’a (Nisga’a Memorial Lava Bed Park) is home to one of the youngest and most accessible volcanic landscapes and features in BC. It’s the site of the last volcanic eruption to occur in Canada, which was only 250 years ago. The lava destroyed everything in its path, sparked fires in the surrounding forests, and covering two Nisga’a villages with more than 2,000 people perishing. When you visit Nisga’a Memorial Lava Bed, you are able to take a 3-km (1.9-mi) guided tour through the scenic old-growth forest, past diverse volcanic features to a viewpoint overlooking the crater. While you’re exploring, please stay on the marked trail; lichens cover the majority of lava flow and a single footprint can set back hundreds of years of growth. Interesting fact: The park was the first in BC to combine interpretation of natural features and native culture, and be jointly managed by a First Nation and BC Parks. In BC’s Thompson Okanagan region, you will find Canada’s only ‘pocket desert’. 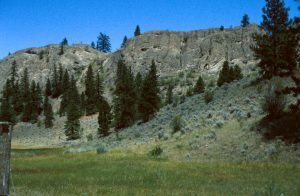 The semi-arid, shrub-steppe grassland is located in the South Okanagan, starting in the Okanagan Valley and extending to Okanagan Falls. There are many opportunities to explore the arid grasslands of BC. You can hike beautiful trails that showcase the diversity and beauty of this dry landscape, such as South Okanagan Grasslands Protected Area which is home to 1,873-metre (6,145-foot) high Mt. Kobau, White Lake Grasslands Protected Area where you’ll find desert wildlife like tiger salamanders, rattlesnakes and golden eagles, and camping hot spot sẁiẁs Provincial Park (formerly Haynes Point), a narrow band of land stretching into Osoyoos Lake in the hottest, driest part of the country. Interesting fact: This arid landscape is one of the most fragile ecosystems in Canada. Prior to European settlement, it occupied nearly 10,000 hectares (24,711 acres); today just over 30% remains. The grasses and shrubs of the antelope-brush ecosystem provide homes for nearly 90 endangered and threatened species in the province, 32 of which are vertebrates. Many are only found here.